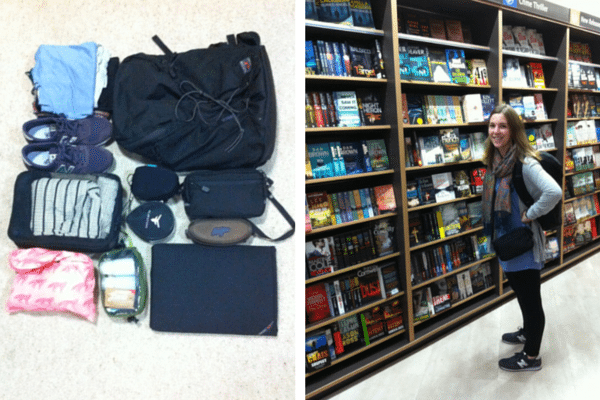 Tom Bihn’s Smart Alec: Is this the best backpack you’ll ever travel with? A reader recently asked me what my preferred backpack is these days, and I didn’t even hesitate before responding with the Tom Bihn Smart Alec– a 26L streamlined, minimalist backpack with a tough-as-nails construction and the ability to be customized depending on your travel needs. *The bag is best for trips that are not long-distance hikes, don’t require special gear (e.g. a trip to Lapland) and for travelers that don’t have special needs (e.g. diabetics). Even if you’re not a minimalistic-minded traveler, I think you’ll be impressed with what this bag has to offer. 1) The construction– Tom Bihn produces 100% of their products in the USA, and in their Seattle factory, so they have a better control over quality, and it shows. It just feels like an extremely sturdy bag! 2) The simplicity– With just two outside side pockets and three internal pockets, there is nothing to get in the way of maximum space usage. And without all the additional fluff and built-in doo-dads that might be found in other bags, you save weight, and you get to customize the feel on your own. Since receiving, I’ve used this bag in a variety of situations including long-weekend trips, a month-long trip to the States, and just to haul Aroamas down to my Sydney market stall. I’ve gotten a feel for what this bag offers in real-life situations, and here is a run-down of its features. Left: bungee cord; Right: Inside the bag, opening the top flap. The front bungee is a simple device that allows you to hold on to additional items that may not need (or fit) in the bag itself, like a jacket, umbrella, or yoga mat. I’ve even used it to hold my rolled up Aroamas banner for my market stall. When I don’t have a very full bag, I will cinch the bungee up real tight so the bulge of the bag disappears and becomes more streamlined. >> You can replace the front bungee with the heftier 1″ Gate Keeper Straps if you’re needing to secure heavier items. You can also add on the Lower Module Pocket in the same place (shown later in post). Left: Side pocket with small pouch via O-ring; Right: Side pocket holding water bottle. The two external side pockets disappear when zipped up, but open a whole world of space and organization when unzipped. One side contains a layout perfect for storing a water bottle, while the other has space for two pens and a pocket that can be useful for a small notebook or phone- plus an O-ring to secure items you don’t want falling loose. The main compartment flap unzips wide- so wide that you don’t feel confined by the top-loading nature- and holds a zippered pouch with two separate sides, which are great for small items you don’t want to have lost in the bottom of the bag. Further down in the compartment is a third pocket without a zip closure. Besides that, there is an O-ring to clip on another Tom Bihn pouch, clip on a stuffable bag, or secure your keys. And, if you want to add in one of their laptop cases or organization folders, you can use the rail loops or Annex Clips that are also included in the design. The Upper Modular Pocket and Lower Modular Pocket add-ons create another 2 liters and 3 liters of space respectively for a total size of 31L in backpack space if needed. So when your flights allow for a bit more carry-on weight, you’re good to go! Left: Bag with upper and lower modular pockets attached; Right: The bag straps in all their glory. The straps are padded, yet not too bulky, and there is an included (and removable) waist and sternum strap if you plan to do a bit of walking with it on. This is still a feature of smaller backpacks that I wish were improved, though. The waist strap does help, and better than other bags I’ve tried, but it would be awesome to have a smaller bag with a more supportive waist strap. This is probably my one downside of the bag. The size: At 26L (31L with add-ons), it’s the perfect size. It’s spacious yet small enough to travel light and efficiently, and without the temptation to add in the unnecessary. The construction: I already mentioned it, but the bag and material is very very first class. The no-fuss attitude, unless you want that, of course: It’s minimalist by design, but can also grow and adapt as necessary… and also by design. With its streamlined shape, it doesn’t stand out too much in a crowd. The light weight: My model weighs in at just 865 grams (1lb 15oz)! When the bag itself weighs less, you can pack more! The versatility: Short trips or long trips. Use as is or make it your own with add-ons. I love that it has a more “professional” vibe than other backpacks on the market, which makes me feel a bit more inconspicuous in crowds and even not too phased when walking into a nicer hotel. The hipbelt: When you have a small bag, you would think that a stronger hipbelt wouldn’t matter. The truth is, especially for women with smaller bodies, carrying 10kg (or 22lbs) can do a number on the shoulders. Some sort of improved hipbelt could be awesome, but it’s not a deal breaker. Side compression straps: There are none, and when the bag isn’t fully packed, you have no good way of taking out the bulk. Tightening the bungee on the front of the bag helps, but it’s not the same. Women focused models: I have a smaller upper body with narrow shoulders. What this bag currently has in terms of straps is not bad, but it could be better if it was designed more with a woman in mind. Overall, I honestly wouldn’t change much. If you’re looking for a minimalistic backpack with the capabilities of adapting when and where necessary, I would definitely recommend the Smart Alec by Tom Bihn. Grab one from their site. >>See all women’s travel backpacks here. I realized some time ago that backpacks specificly designed for either biking (aka bicycling) or hiking are just perfect as daypacks. They are designed to be functional and light, they tend to have rain covers, plus they have really good hip belts. And chances are high you can find a backpack designed for women, at least with brands like Vaude, Deuter and Tatonka. I own a Bike Alpin 30+5 (unisex) by Vaude and a Bike One 18 (for women) by Deuter and it’s just perfect. One has only to keep in mind that bike backpacks are not designed for hiking, so the hipbelt doesn’t sit on the hips, because that wouldn’t make sense when biking. It works for day tours and of course backpacking, no problems, but that’s about it. If I want to go trekking, I’ve got a backpack just for that. I especially love the Bike Alpin, because it’s so comfy and compact even when being full to the brim. I have this bag! I’ve only had the guts to take it on short trips so far, but I love its look and more portable profile. I’ve experienced the same shortcomings as you (I’m 5’2″ with narrow shoulders), and given that it’s not perfect, I’m still looking for that elusive perfect-for-me larger bag that’s carry-on sized, looks decent in the city (not a real trekking pack), and is sized for my body. But the Smart Alec has a place in my pack wardrobe for sure. Just came back from a two-week trip to Bangkok and Cambodia where I used the Smart Alec (Black Dyneema/Wasabi) as my sole bag! I had a Tom Bihn Side Effect in one of the side pockets and my toiletries in the other one. Loved it! Very cool Tania! It’s a really nice and surprisingly spacious bag! Hi Brooke! Looking in to backpack and hoping to figure out how many large of a pack I need. Do you mind giving an approximate list of what you were able to fit in this backpack? Can’t remember completely but I packed very little on that trip so I still had room to spare and came in at 7kg. You can fit more in the bag! I packed in 1 jeans, 1 lounge pants, a couple of shirts and tanks, a long sleeve thin top, a pair of Tieks, fold-up flip-flops, socks, underwear, bra, toiletries, laptop and charger, sunglasses. Wore leggings, long tank, long-sleeve tee, pashmina, New Balance shoes. Picked up a book to add to it at the airport.